The Coach in the video is PGC Basketball Director Sam Allen. 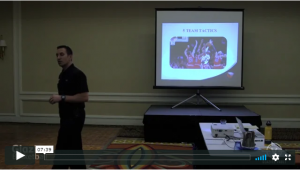 This video was filmed at a PGC/Glazier Basketball Coaching Clinic. You might not agree with this exact system, but I hope that it helps you think about ways to improve the way you teach and communicate your defensive conversion. Click the play arrow to begin the video. Also, please make sure that your sound is on. Great video, PGC. Clear concepts, clearly delivered.